If you’ve been keeping up with the latest in digital marketing trends, you’re probably familiar with heatmaps. A powerful tool used by successful Internet marketers and in affiliate marketing campaigns, they can tell you a lot about a website that other analytic tools can’t. There are a few different types heatmaps, however, the one most commonly used is the ‘Mouse-tracking’ map. A mouse tracking map measures … you guessed it — a visitor’s mouse activity on your site. By measuring where your visitors drag their cursors, you can determine their behaviour while on your site, and what appeals or doesn’t appeal to them. One of the best things about heatmaps is that they’re easy to use. It’s a simple visual tool that doesn’t require reading statistical information, graphs or analytic logs. This allows more people within your organization to understand what is popular on your site, and where improvements can be made. Also, because of their real-time capabilities, they are very accurate as you can measure the activity on a per-visit basis. After implementing a map on your landing page, you might find some very (interestingly) common behaviour of your visitors. People don’t like to scroll. If there isn’t something that catches their attention immediately, they’re very likely to leave, resulting in a high bounce rate. If your visitor does happen to scroll, you will notice that they quickly lose interest the further down they go. Like birds and other animals, people like bright, eye-catching things, and are drawn to icons that stand out. If you are selling products on your site and they come in various colours, display one that stands out among other products. Similar to the first behaviour, when posting blog content, people prefer to read summaries that deliver the most relevant information with minimal reading. You can choose to link a full article at the bottom of your blog, giving your visitors the option to read the full-length version. People respond well to faces. This proves that humans are emotional beings, even when it comes to browsing the web. 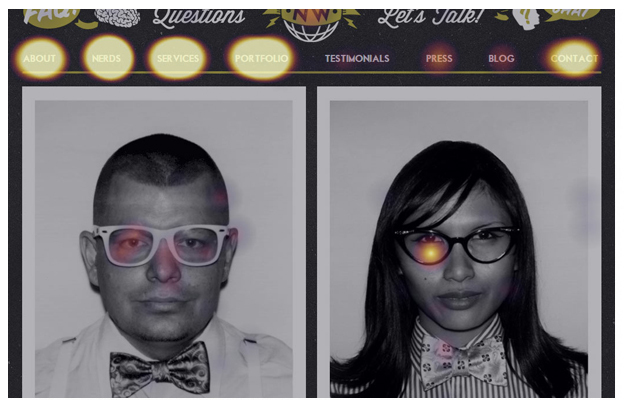 By using photos of people, you can effectively guide visitors to various parts of your site. Image is everything. Invest in quality—As cliché as it sounds, people love captivating images and by using quality, high-resolution images, you are more likely to engage visitors and convert them into customers. Strategic placement of images can also guide visitors to where you want them to go. People have been conditioned to ignore banner ads. Known as ‘banner blindness,’ visitors have a tendency to scroll past anything that resembles an advertisement for something they’re not interested in. If people come to a photography site, chances are they’re interested in photography—not discounted office services. So if your content resembles a banner ad, ditch it.